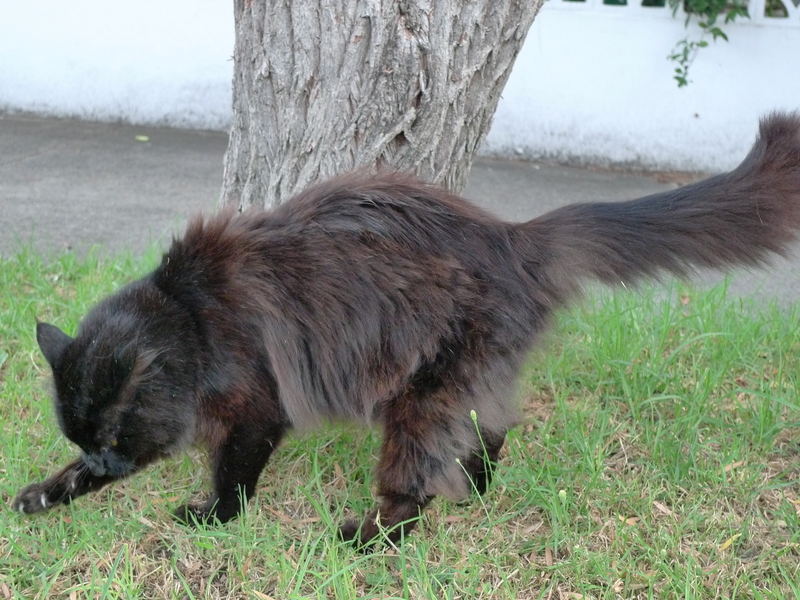 Not my cat, here caught tidying up after the (lesser) dirty deed on the nature strip. He isn’t the smartest or most enterprising of cats, so his enthusiasm is confined to cat food or scraps (dropped – he’s no leaper) from the table or the kitchen bench. Nor Diesel, who lives two houses down from us. He is much smarter than our cat and an indefatigable hunter. 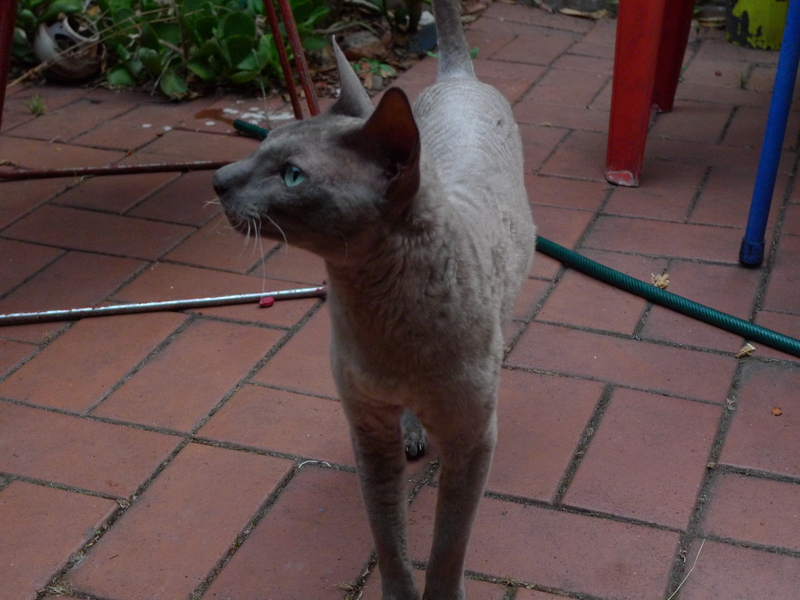 D has seen him leap into the air to catch a bird (successfully) and we have also lost fish to him. We suspect him of catching the frog which disappeared from our garden last year. It is because of him that our temporary fish pond in a shopping-trolley is encased in additional wire and netting protection. I sometimes worry what might happen if Diesel were to attempt to slip under the protective wire and netting, though he is probably too smart to try. Would he make it out, or would he drown? And nor was Selima, Horace Walpole’s tortoiseshell cat, whose fate (circa 1747) is the source of that worry and the occasion for Thomas Gray‘s poem, “Ode On The Death Of A Favourite Cat Drowned In A Tub Of Goldfishes,” (also here) which I can’t resist setting out in full. The sixth stanza contains a melancholy truth, that “a favourite has no friend,” but the last ends in a pointed sentence of no relation to the purpose; if what glistered had been “gold,” the cat would not have gone into the water; and, if she had, would not less have been drowned. In fact, Johnson was rather severe about Gray altogether and about all of his works except for the Elegy in a Country Churchyard. Part of the key to this must surely be that Johnson, who was Gray’s near-contemporary, having worked his way up from Litchfield via Grub Street, took a rather dim view of Gray’s hobnobbing from a rather early age with those much richer than himself, and what Johnson saw as an unseemly affectation of dilettantism or amateurism in one who lacked the means to support this. It probably also should not be overlooked that Johnson was a Tory, whereas Gray’s patrons were Whig grandees. Gray is usually thought to have been at least temperamentally gay. Johnson also comments on his “effeminacy” and much is made of his homosociality. If there were any doubt, and however vexed the question of a “gay sensibility” may be, this poem would for me be the clincher. I particularly like the allusion to a cat’s proverbial nine lives in the penultimate stanza. Last Thursday I went to my first SSO concert for the year, in the Mozart in the City series at City Recital Hall, Angel Place. I have only occasionally attended these concerts in the past, mainly because the time is not really convenient for me (too early to go home and have a nap beforehand and in any event impossible to drive back in to the city and park at that hour). I took up a generous discount offer this year with the result that each concert only costs me a modest $30. In some ways, I feel I have come too late to the series: the programming was more adventurous in previous years than it seems to be this year. Michael Dauth, co-concertmaster, was the soloist and otherwise led from the concertmaster’s desk. In previous years, Dene Olding has introduced the program from the stage. This year, ABC Classic FM announcer, Damien Beaumont, has been brought in for this purpose. I’m not a fan of this sort of thing, and nor were the two elderly ladies sitting to my left. One of them said to me, rather earnestly, “they have a pre-concert talk,” from which I took it that she was of the view that those who want such information should get it there. It was clear that Damien was also labouring under something of the same difficulty, given that much that he could say could already have been divined by his audience from the free programs which are now provided. I appreciate that the SSO wishes to impart to the concerts a more welcoming and less intimidating atmosphere, particularly for novice concertgoers. However, a very large part of the audience appears to be veteran concertgoers who are attracted by the early start and finish of the concerts. They are in no need of either compulsory jollification or provision of relatively rudimentary information. I expect quite a lot of them would rather have less talking and an earlier finish, or else more music. To me, the degree of jollification which Damien Beaumont obviously felt compelled to deliver betrays a lack of confidence in the capacity of the music itself to carry the program. I would prefer it if in subsequent concerts he toned this down a bit and took an approach (which can still be quite conversational and welcoming) more like the sort of thing he says as a broadcast announcer. I would also prefer it if he eschewed comments of the “Wasn’t that great!” or “Are you having a good time?” sort. That’s really up to us, and quite indecorous of concert management to impose or declare. I also hope that in the future he will have a less sibilant-sympathetic microphone to work with. Whilst we are on the topic of accoutrements to the music, it is a shame that the program did not identify the players who were actually playing. A number of players who I presume were Sydney Symphony Fellows (younger players given work experience for a year on a stipend) were not identified at all. And this was the third time I have read the magazine-style vignette about second flautist Carolyn Harris. Such nit-picking aside, I enjoyed the music, though just occasionally the interpretation seemed a little undercharacterized (eg, the beginning of the development in the second movement of the Haydn). Michael Dauth had a bit of a nervous evening – he forgot his music at the beginning and dropped his shoulder rest during the Beethoven – and I thought he looked more relieved than exhilarated when it was all over. The Idomeneo overture was not as exciting as the last time I heard it in that hall, in Pinchgut’s production. I put that down to the sense of occasion that an overture can have in its proper context rather than the playing itself, though it is also a question of the piquancy of original instruments, and especially the flutes. The SSO took the non-continuo approach. For me the highlight of the concert was the Idomeneo dance movements, which exhibited a more Frenchified Mozart than we usually hear. The originally advertised program had these at the beginning: it was the right decision to put them at the end. Afterwards there was to be a Q&A session with a panel of three players and Rafe Wilson, the orchestra’s artistic manager. In my experience these are usually lame affairs: the problem is generally the quality of the questions rather than the answers. I did not stay for this. Instead, I caught up with C, whom I first met in 1978 when our timetables put us in the same tutorials for English I (Peter Shrubb – rumoured to be one of two surviving Leavisites in the department at the time, but memorable chiefly for the care with which he would hitch up his trouser legs to preserve the crease) and Early Modern European History I (Iain Cameron and Alastair MacLachlan). C now lives in London but is on a flying visit back to Australia to see his parents. We adjourned to the Westin (the conversion of the old GPO was news to him) and made our own conversation. It’s maybe three or four years since we last saw each other, so we had quite a lot to catch up on, not to mention a certain inevitable amount of reminiscence by the way. It’s now a fortnight since Michael Kirby retired from the High Court of Australia. How shall we manage without him? In the burst of publicity which surrounded his last circuit of the showground (at least as a judge) we have had teasers from a forthcoming biography. A Festschrift of sorts has also been published. RRP (so far as there can lawfully be one these days) about $59. Kirby has a large and quite devoted following and it is hardly surprising if publishers want to cash in on it. The prospect of a biography by A.J. Brown of Griffith University is the more intriguing. The teaser publicity has concentrated on who said what to whom at the time Keating approved Kirby’s appointment. Lavarch, Attorney-General at the time, has (broadly speaking) confirmed that certain things were said. Keating has denied the account. Kirby, as is well known, is perhaps Australia’s, and certainly also the judiciary’s (possibly worldwide) most prolific speech maker (vice-royalty and elected politicians aside). Inevitably he has let drop little snippets of reminiscence. Kirby claims that at law school it was Murray Gleeson who, by nominating him for some position in his absence, started him off on his student political career. He seems to have protracted his time at university by undertaking an Economics degree during his early years as a solicitor in order to prolong this. Student politics brought him in contact with top people at the top table early in life. Politics is the other career he obviously might have had, and some of his detractors would probably say it is a career he has never really abandoned. Everyone has their reasons, but objectively speaking it seems fair to surmise that Kirby’s sexuality was an obstacle to his path either to a bishopric or as a professional elected politician. Apart from that, his Ulster protestant background probably precluded a path in Labor politics, assuming that to be the direction he might have taken. In Australia we generally do not think highly of politicians, but they must nevertheless possess some distinctive talents in what they do. Kirby has traits common to those “political” people I have known, including an energy to maintain and cultivate a wide circle of acquaintance. You can call that networking if you like but that doesn’t really capture the whole thing. He often talks of those who have been his mentors. He is great at buttering up his audiences -he will be asked back. He keeps in touch with people: he writes them little notes in a truly elegant hand; in the days when he was President of the NSW Court of Appeal he was reputed to mark any kind of visit (obviously not actual official business) with a photo of himself with the visitor which he subsequently sent to them; I am sure he is an indefatigable attender of funerals. Another way of putting that is that Kirby is a great promoter of brand Kirby. I’m not criticising him for that, though I expect it is something which annoys some, especially those who have known him since their youth. I first met Kirby at a memorial service at S James King Street for Peter Dennison, professor of music at Melbourne University (but originally, I think, from Wollongong and Sydney) after his untimely death, aged 47, in 1989. We weren’t introduced though we conversed briefly at some point. Along the pew I could tell he was an old hand at such occasions. I wandered into the service because I was at law school across the road at the time. I won’t say I knew Dennison well – I only met him twice – but I had known SK, Dennison’s partner in his final years, since first year at Sydney Uni. They both died of AIDS. By then Kirby’s sexuality, though not officially acknowledged, was no secret at least to law students or to anyone at all well educated about such matters. I don’t think it is entirely a coincidence that around about this time Kirby started popping up as rather a kind of secular bishop of AIDS causes. In retrospect that was a very long dry run for his ultimate official coming out in 1999. In case you might think that is rather late in life, the subsequent (and since discredited) Heffernan accusations of use of Commonwealth cars to ferry rent boys show why Kirby might well have delayed it further. An outed public figure is always at risk of such retribution in a way that a straight person or an “everybody knows but no one says” gay figure is not. the parallel but (judging from little hints which are too subtle to enumerate here) also divergent lives of Kirby and the late Justice Graham Hill of the Federal Court, whom Kirby first met at Summer Hill Opportunity School way back in 1949, and who, like Kirby, then went to Fort Street, Sydney University Law School and, eventually, the bench. Biographies of living people are problematic. It’s not simply a matter of defamation risks (though that is a factor) but also a question of privacy, not just of the subject of the biography, but of others. Kirby hasn’t finished his active or even his public life yet so I very much doubt if Kirby would be prepared to co-operate with the preparation of a full kiss and tell biography – even using that phrase only metaphorically. Nevertheless, I hope such material is preserved for a later date when more can be told, and particularly for the benefit of gay people who could learn from the links that Kirby has to life before the great change in gay people’s lives which has occurred in Western societies since his youth. On Monday 14 July 1997, Mrs Maria Bergamin arrived at an office building at 5 Bowen Crescent, Melbourne. There she found that the foyer of the building had been badly damaged. A glass and stone partition, timber panelling and stone floor tiles had been removed. She was shocked and dismayed to see what remained of the floor stone work being jack hammered. A large bin was filled with the debris of the foyer. This destruction had been carried out by a tenant, Tabcorp Holdings Ltd (“the Tenant”), the appellant in this appeal. OK, the second paragraph gets bogged down a bit in the detail, but it’s still pretty punchy. It’s a unanimous joint judgment, so we can only guess who is the latter-day Denning (Lord, not Ray, the famous prison escapee). The tenant took the view that it could do what it liked and if it had demolished the foyer without consent it only had to pay the difference in the value of the property at the end of the lease. The trial judge agreed with the tenant’s approach, and awarded the landlord a paltry $38,000 in damages. This was the cost of restoring the premises to its original lettable area (there was, oddly, an award of $1,000 as “nominal damages”). Other than that, he held that the unauthorised works did not make any difference to the value of the property. The Full Federal Court awarded the landlord reinstatement costs of $1.38 million. The High Court rejected the tenant’s appeal. From their Olympian vantage point (gods not games), it all seems pretty simple. The so-called “doctrine of efficient breach” was decisively rejected. Nor was it necessary for the landlord actually to intend to do the rectification work in order to receive such damages – it was sufficient if the rectification was “necessary and reasonable” to put the landlord in the position it would have been if the lease conditions had been observed. The judgment is destined to enter the contracts textbooks and probably casebooks, at least in Australia. For litigators and old hands there are a number of other twists and turns between the trial and the final appeal which which will probably be passed over in contracts courses and which are too complex to go into here. Tabcorp is still in occupation under a subsequent lease which expressly preserved the landlord’s rights under the original lease, so it is too early to tell whether the landlord will or will not actually carry out the rectification. Students of the future may well be curious to know. Personally, I’d savour the decision more if the Bergamins simply kept the money, as they are entitled to do. The principle is good, but the money is even better! It is worth noting that in NSW and other states which have adopted a 1927 English statutory reform of the common law, the damages would probably have been as the trial judge awarded. 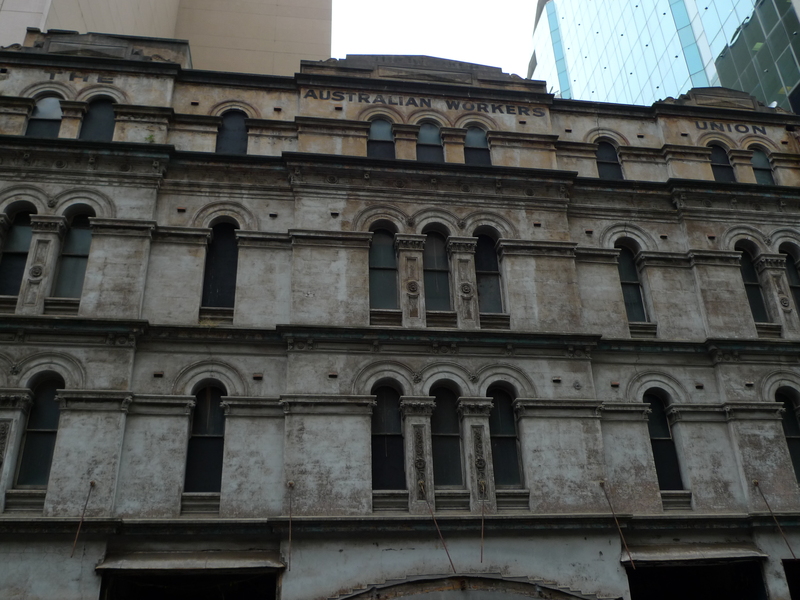 The AWU Building is not a heritage item. I had never really looked at this building until it caught my attention late last year one day when walking back from the District Court. One reason I couldn’t take a picture anywhere near as good as that is because this building is opposite Castlereagh Street Fire Station and they were having a kind of fire truck convention on the day I walked by, camera in hand. 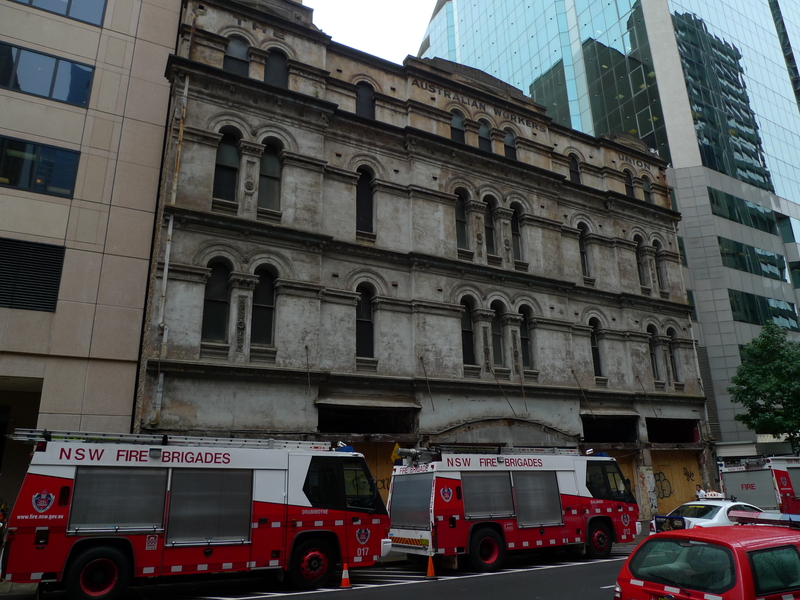 The AWU Building (Castlereagh Street) was constructed in 1878. It was originally known as Protestant Hall and is associated with the Irish Protestant movement in Australia. In 1937 the building was transferred to the Australian Workers Union, one of the first unions in Australia, who occupied the building for a number of years. The AWU Building is not a heritage item. The building was on the City’s Heritage List in the late 1980’s, but was removed from the list following a review in 1992. 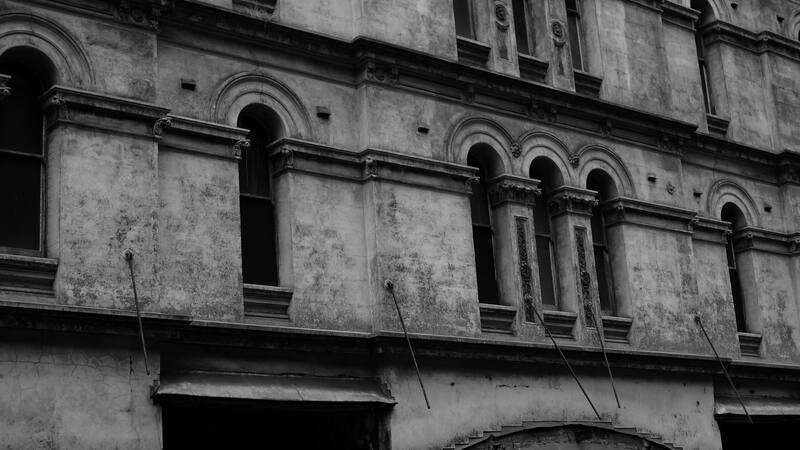 The building remains on the Register of the National Trust (NSW). DA 91/00098 was approved for the redevelopment of the site by Council on 21 December 1991. The approved FSR was 11.59:1, within a 22 level mixed use commercial/club building, with 3 levels of basement parking and the retention of the façade of the AWU Building. DA 99/01035 was approved on 15 June 2000 for a Rice Daubney Group designed mixed use office/hotel/club/residential tower with an FSR of 13.13:1. The consent for this application lapsed in June 2003. This application proposed the demolition of the AWU Building. DA 03/00029 for the demolition of the AWU Building was lodged on 15 January 2003. This application was withdrawn by the applicant on 5 January 2004. Following this, officers advised that demolition was not the preferred approach. The site is owned, together with the building adjoining it on Elizabeth Street, by the Hellenic Club. This probably helps when the time comes to crank out letters in support of a development application – there were 10 objections and 55 letters in support of the 2003 DA, which seems to be the latest. The subsequent fate of the development application and indeed the proposal is unclear. The recent removal of the awning suggests that something is afoot, and that all we are going to be left with is the façade. I expect we are supposed be grateful for that. 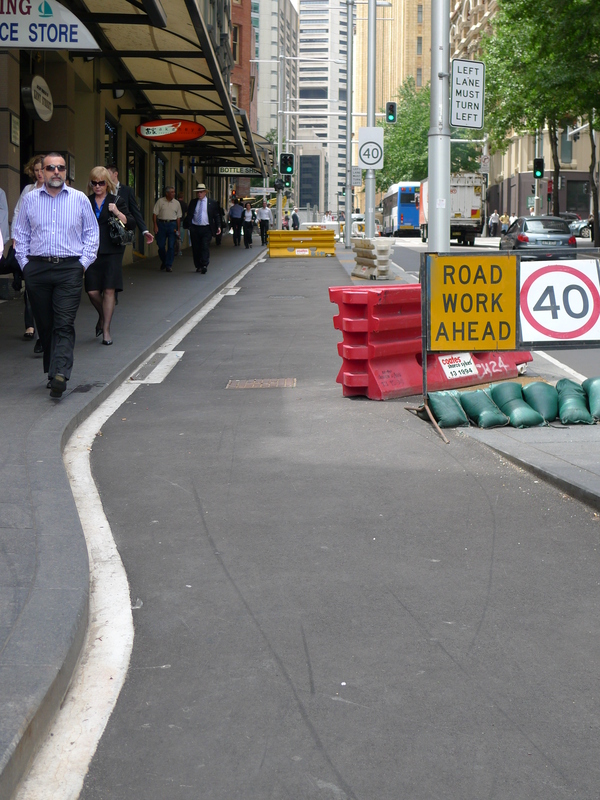 I wrote last year about the interminable saga of the construction of the King St cycle way in the city. 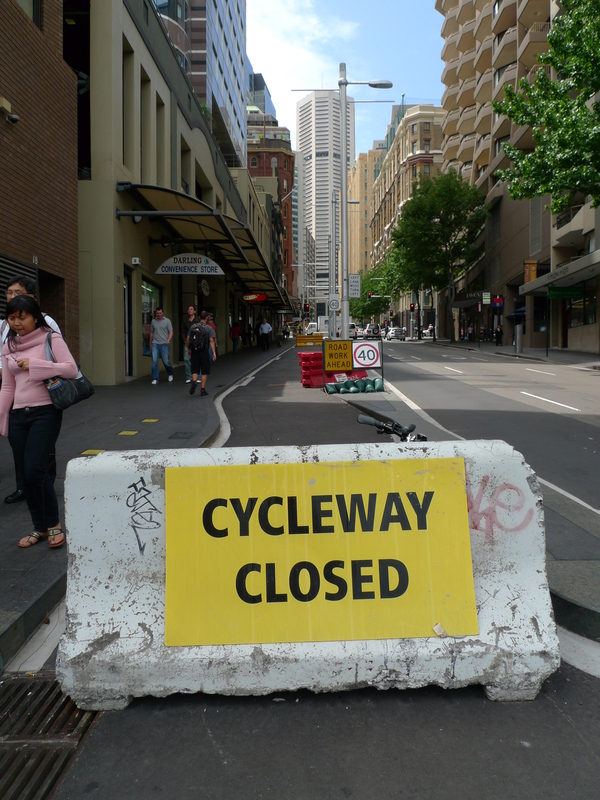 As you can see from the above picture, the cycleway (I obviously can’t make my mind up about one word or two for this) has still not opened. It has been at this state, which to a lay person might seem to be practically complete, since late November or possibly early December. 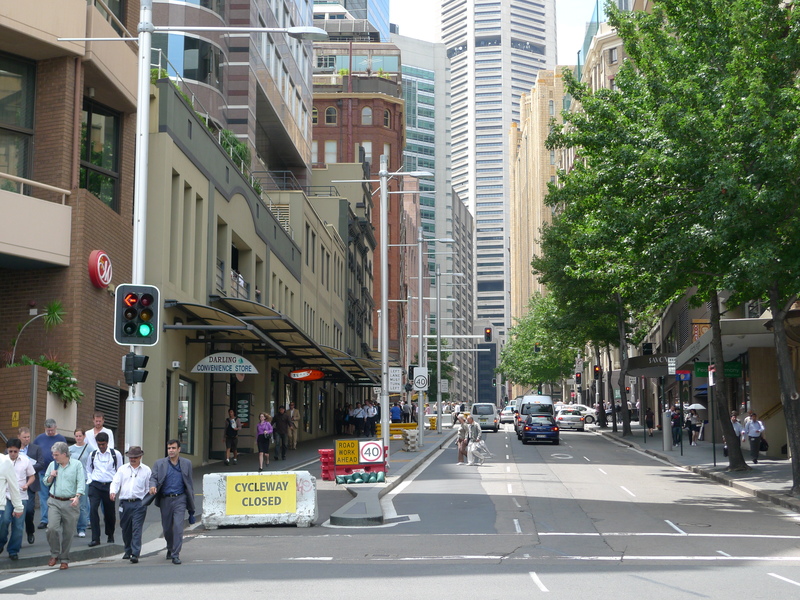 Before Christmas I was informed by a representative of Sydney Council that it is yet to be opened because it is not yet installed with linemarkings and the lanterns at intersections are being reviewed by the RTA. There does not appear to have been any progress since then. Trees are also to be planted in April, but this is apparently not expected to delay the opening of the cycle way. Just how hard is it to paint a line? In any case, we’re all familiar with the sign “New work – no lines marked” so this hardly seems a critical factor. Just what is the RTA up to? A closer view below. It will be nice when it is finished. The “road work ahead” refers to where the whole process is being repeated for the next block, between Kent and Clarence Streets. That is meant to be finished by April, though you have to wonder about that. Reviving from estivation, I have struggled to find a topic momentous enough to justify a re-entry to the blogosphere. With the journal habit broken, I’m confronted by the unimportance of anything I have to say. In addition, the staples of such reportage I have to offer have themselves been in recess. I have been to only three musical events over the summer break. One was All Tomorrow’s Parties – the Nick Cave curated festival held over two days in January on Cockatoo Island as part of the Festival of Sydney. D and I went on the second of those days on the strength of a personal connection. Festooned with an “Artist” laminate which gave me access to some backstage areas (and refreshments), I was spared some of the rigours of the event: never have I seen so many nocturnal people out in the open huddling in so little shade. It wasn’t really the kind of music on which I feel qualified to offer much of an opinion. The review in the Herald seemed transfixed by the event’s boutique nature and atypically well-behaved and middle-aged crowd. I guess the $150+ ticket price played a part in this. D received a big smile from Justice Liz Fullerton (in a sensibly big hat), though he wasn’t sure what provoked this beyond the prevailing agreeable mood. Apparently on the first day Malcolm Turnbull was spotted bopping up the front, though I suspect the Sydney Festival free list rather than the trifling ticket price played a part in that. “That’s it!” one musician was heard to exclaim, “I’m giving up playing.” That seems an over-reaction. D and I also went to the first night of Cav & Pag and, with K and J, to the second night of The Magic Flute. Neither of these was really earth-shattering. I’m inclined to agree with Sarah that Jonathan Summers was the real star of Cav & Pag, and particularly in his bravura delivery of the prologue to Pag. The Magic Flute was K and J’s first night ever at the opera, and so their reaction is probably more important than my own slightly jaded one. Emma Matthews as Pamina and Catherine Carby (2nd Lady: luxury casting in OA terms) were (disappointingly, to me) indisposed, but this didn’t matter for K and J. A good time was had by all. I share Peter McCallum’s view in the SMH (not online) that Ollivier-Philippe Cunéo, the conductor, was tipped into something a bit beyond his present capacities in being entrusted with the whole run of this work. Mozart is never easy. Even allowing for the possibility that McCallum’s review put me onto the case, there seemed to be rather a lot of “unforced errors” – mostly to do with cadential relaxations of tempo (or not) and negotiation of transitions between tempi. These cried out (to me anyway) “conductor needs more experience.” The general orchestral sound was also rather underwhelming – I wondered if they’d decided to skimp on the string numbers. That’s it on the musical front. Otherwise, up to last weekend, I have been immersed in the responsibilities of keeping the machine for living going whilst my sisters and nephew have been staying with me, off and on, since before Christmas. I’m still recovering from that. Both of my sisters left Sydney in their twenties. The result when they return is a bit like drilling down for a core sample, as they revive contact with the friends they have left behind – including family friends from our childhood who remain in Sydney but whom I never see except when my sisters are here. In addition, there has been the annual stocktaking of a kind which Christmas brings. All of this brings me back into contact with the world of families – children, parents, grandparents, from which my own day-to-day life is largely insulated. If there were really any doubt about it, this all brought middle age home to me. Friends and contemporaries now have children ranging from infancy to university age; at the other end, parents are becoming infirm (well, a few have died) or, even if not yet infirm, talk of Exit International. This last parenthesis will presumably lead to this post being banned once the great firewall of Australia goes up. Finally, as per the above picture, I’ve started playing the piano again. Perhaps that’s another reason my blogging has faltered. So far I am specialising in pieces which are either simple or slow. As the above picture shows, my current fare includes, for the benefit of the curious: (left) the Liszt-Schubert Ständchen as well as (at this stage more a technical exercise than anything musical) Abschied; (centre) a Hungarian anthology of “Early Dances” (from a series called “Piano Step by Step”) – I particularly like the breezy Handel Courante; and (right) Chopin Nocturnes, starting with the first two, which are probably also the easiest and simplest. Now I have to get the piano tuned. You are currently browsing the Stumbling on melons blog archives for February, 2009.